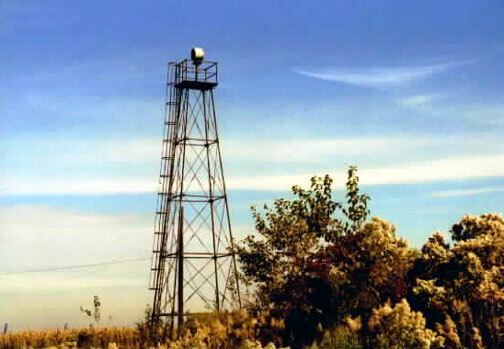 The two Brewerton Channel Range Lights were lighted on November 1, 1868. One structure was near Hawkins Point and the other on Leading Point. Together they marked the Brewerton Channel in the Patapsco River into Baltimore. 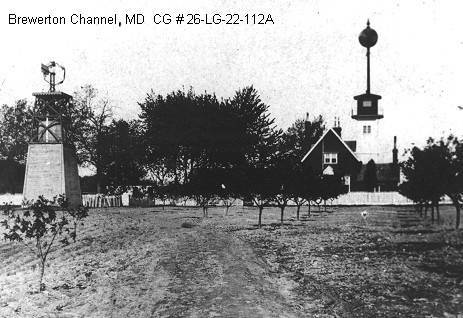 The channel and range lights were named after Henry Brewerton, an engineer who had worked on defenses around Baltimore Harbor. 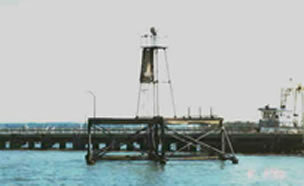 The Hawkins Point Light was the front-range light and was unique screwpile structure – rectangular. It was located near the mouth of the Patapsco River about 7 miles east of Baltimore. It housed two lights. one on top of a wooden tower and the other in the dwelling's top floor. The wooden tower was removed in the early 1900s. 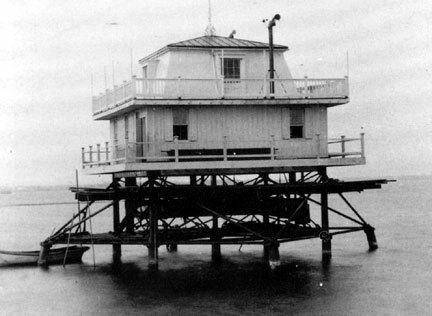 The lower light served as the Brewerton Range Front Light until 1924, when the dwelling was removed. In 1924 the lighthouse was demolished and the range light was relocated to the substructure of the lighthouse. Leading Point was the rear range light and was built on a bluff. It was a brick dwelling surmounted by a lantern and a black ball day marker mounted on tower. This light was located about a mile from Hawkins Point Light. In 1915 a single keeper was put in charge of both lights. The light was moved to this skeleton tower adjacent to the foundation of the old lighthouse in 1924. Historic photos courtesy of Coast Guard. Modern photos courtesy of Virginia Slechta. An excellent view can be obtained from the pier at Fort Armistead Park of the Brewerton Front Range. An excellent view can be obtained from an adjacent unpaved road near the Francis Scott Key Bridge of the Brewerton Rear Range light. Do not attempt to enter the industrial area where this light is located.